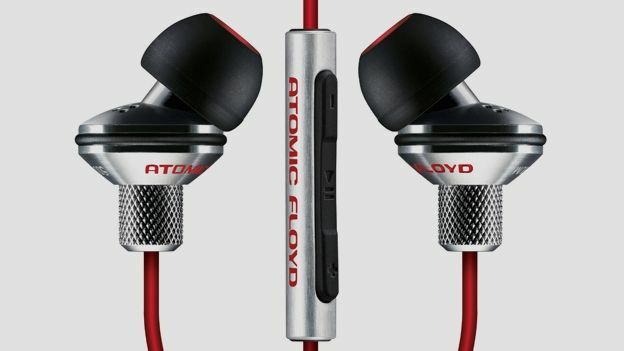 Can Atomic Floyd's experts serve up another pair of quality headphones? The Brit audio expert is back with another pair of beautiful in-ear headphones in the shape of the Atomic Floyd HiDefDrums. Can it impress us again? Atomic Floyd has wowed us before: we were more than impressed nearly a year ago when we got hold of its SuperDarts. Now the stakes have been raised, and we're expecting big things from the HiDefDrums. With classy operators like the Klipsch Lou Reed X10i and Sony's XBA-4 hitting the market, and the eternal presence of the Sennheiser IE80s, these in-ear 'phones have got their work cut out to make an impact. You can be the judge, but we think these headphones look fantastic, and the brushed metal finish on the earpieces and in-line unit speaks volumes of the premium build quality on offer here. The Beats-esque red cable is a nice touch too. Like any in-ear headphones, these aren't going to suit everyone and sometimes you'll find that they just aren't comfortable. This isn't the fault of the headphones - more the body's natural reaction to having something stuck in your ear. As in-ears go though, we can't fault these for comfort. The dual-injected silicone earbuds seal out a lot of ambient noise, and though they aren't truly noise-cancelling you won't hear anything outside of your music at higher volumes. You get small, medium and large earbuds in the package, but for the price we wouldn't have minded a few more alternatives as earbuds are hugely subjective - different people like different materials and sizes. That said, the stock medium silicone buds were perfectly comfortable for a couple of hours use, before that familiar ache started to come back. Even though these ones are made of steel, headphones are always delicate bits of hardware and you don't want to go launching them around if you can help it. Thankfully, the HiDefDrums come with an excellent triple-layered, double-stitched rubberised case to protect them. It's quite a tight fit to get the headphones into the case, but tangles aren't a worry either as the headphone cable is made of anti-tangle fabric, so you can unravel them easily after they've been packed away. The secret to Atomic Floyd's impressive sound clarity is the construction. The 'Acoustic Steel' used by Atomic Floyd is heat treated for 10 hours at 1300 degrees celsius. This makes the steel stronger, allowing it to be thinner and maximising the size of the acoustic chamber. And the result? Impressive. In fact, more than impressive - these headphones sound incredible. They're not the bassiest set of in-ears you're ever going to hear, but the clarity of the sound and of individual channels is superb. This doesn't just go for music either, voice communication with the in-line microphone is also clean and very clear. This isn't only due to the quality of the headphone units, but also down to the quality of materials. The 3.5mm headphone jack is plated with 24k gold, widely accepted as the 'gold standard' for audio transmission. There's really not much to dislike with the Atomic Floyd HiDefDrums. Provided you're already comfortable with in-ear headphones, these are absolutely worth their £125 price tag. With headphones, build quality and sound quality always go hand-in-hand, and we can say with confidence that Atomic Floyd has got both aspects nailed on the head here. Add to that the attention to detail, the anti-tangle cable, sturdy carry case, the excellent compatibility with iOS and Android devices and the great aesthetics... why wouldn't you want a pair of these?